I love travelling with my girlfriends all year around, but one of my favourite times to travel has got to be fall. I love traveling with my girlfriends because it calls for cozy nights by the fire, and girly activities indoors. But in order to have the perfect night in with your girlfriends while you are away, you also need to pack the right items. I have rounded up all my favourite products you should pack for a cozy night in. Best activity to do when staying in with your girlfriends? Manicures! 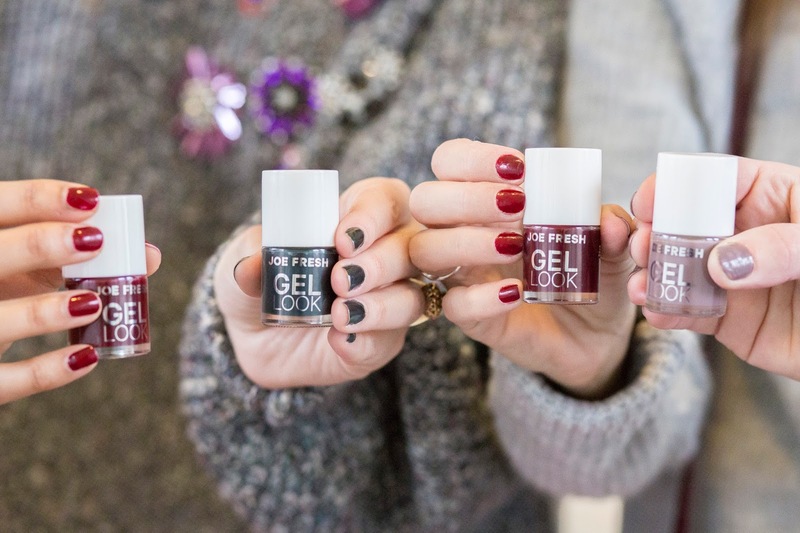 Pack your Joe Fresh Gel-Look Nail polishes for a fun evening of a salon like experience. Sip on your wine, eat some cheese and do your nails while chatting with your girlfriends. Joe Fresh always comes up with beautiful holiday collections. These polishes are super easy to apply, mess free, and they leave your nails with a glossy finish. No one will know you did your own nails. My fave colours from the collection are, Pine Forest, Lover’s Kiss,and Cotton Candy. Since The JW Marriott The Rosseau Muskoka was right by the lake we packed hair products that would keep our hair intact from humidity. I personally use hairspray all the time and the göt2b Glam Force High Hold Hairspray is perfect, because not only keeps your curls in place, it also reduces frizz. Another thing I love about it, is that it is not sticky which is amazing. The Glam Force Sculpting Gel is my holy grail for baby hairs which I got tons of! My routine is to apply the sculpting gel on those little tiny baby hairs that are all over the place followed by spraying the Glam Force high hold hairspray. Then I lightly pat my hair down to lock the sculpting gel with the hairspray. This technique has worked miracles for me when it comes to taming those baby hairs. If you are going away for a weekend getaway in the fall with your girlfriends, then you better be packing those fuzzy warm socks and cozy pj’s. For our weekend away we packed our extremely soft La Vie En Rose pjs and the cutest socks ever. I am wearing these cozy pants. Don’t forget to check out my girls weekend away at Muskoka.